You will remember that we are in the chapter of Gemini who is, along with its 3 decans, showing us the “doubleness” theme of God’s provision during this time of the Lord’s millenial reign. We have also discussed the dual role of this Kingdom’s leader (who is, of course, Jesus Christ). He will be BOTH Head of State and Head of Government. With C anis Major, the Greater Dog, we saw a picture representation of the Head of State authority. Now with, Canis Minor, we see the Head of Government aspect to His leadership. A Head of Government is concerned primarily with securing the physical well-being of society. Head of State, on the other hand, is concerned with the spiritual well-being of its citizenship. 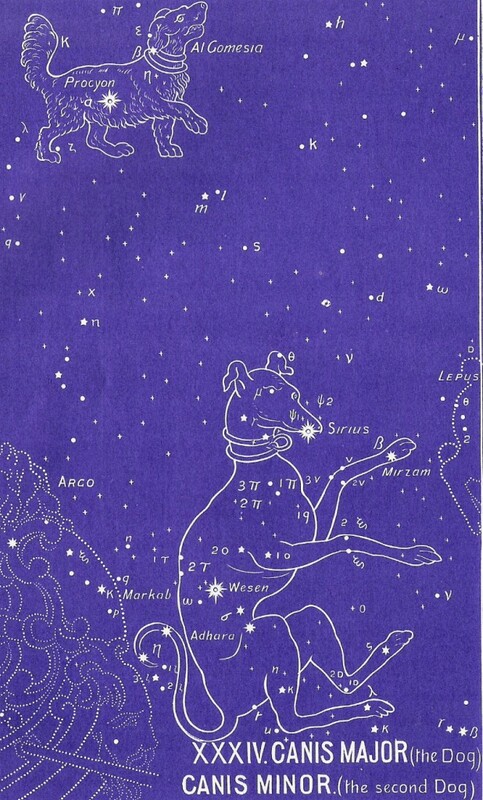 The myths associate this Little Dog with Orion, just as they did with the Big Dog. But here, the idea is not so much a guide dog — but a hunting dog. In fact, one myth calls it the “dog of the giant hunter” (Orion). Another myth relates the Little Dog to the death of its master, Icaius, and how the dog’s faithfulness, even in death, led to the discovery of the master’s body. The Little Dog is seen as a hound, seeking all those that have “gone astray.” Notice that he completely ignores the serpent, Hydra, even though it is supposed to be a verocious snake — a natural enemy of a dog! He is minding His first order of business — the welfare of His Beloved. This sign concludes the chapter of Provision, in which we have seen our faithful God providing all that will be needed to fulfill His promise of a perfect kingdom here on earth, one in which peace and righteousness rule. This is the “doubleness” nature of the King’s rule. We have already seen in previous signs (Centaurus and Sagittarius) in this amazing star revelation that the King Himself will be two-natured — all-God AND all-man. Then we have seen in Lepus that the enemy, Satan, will be bound for 1000 years and the world will be transformed into a perfect paradise. We have also seen in Canis Major that our Lord will be the benevolent monarch who will guide; and with Canis Minor, we see that He will also seek out the lost. EVERYTHING that is needed for a perfect kingdom have been freely provided! Pay careful attention to the meaning of the names of each star. They will ALWAYS back up the message in The Gospel Truth above. To continue in the correct order of the ancient star chart, please select Cancer next.